As usual, I viewed the San Diego Comic-Con’s 2014 edition as an opportunity to get a barometer on the next year in films, along with pop culture in general. I waded through Twitter, online panel recaps, and videos of the various panels to pull together what I found to be the highlights. Paramount: Paramount chose to not list any specific films in the panel description for their mid-afternoon Thursday slot and that presumably led to many brushing off the panel as likely not containing anything exciting. The promise of “Teenage Mutant Ninja Turtles” and “Hercules” clips simply didn’t bring in a thick crowd. Of course, Paramount managed to steal the headlines by late in the day, with Christopher Nolan and Matthew McConaughey making their first-ever convention appearances. The Nolan appearance had been speculated but dismissed by most pundits due to his past lack of attendance for other high-profile films. A well-received full trailer for “Interstellar” was shown amid the panel including some nice crowd banter with McConaughey. Warners’ “The Hobbit: The Battle of the Five Armies” received favorable feedback but not overwhelming buzz. The most amusing story of the convention related to either the Hobbit or director Peter Jackson was Jackson’s secret attendance of the convention in a jester costume. Perhaps tellingly, the “Jupiter Ascending” portion of this panel received very little online press or buzz. Marvel: Despite the Edgar Wright controversy, further cast drop-outs, and tongue-in-cheek fan protest(s) (ex. the “Edgar Wright was Right” protester outside of the convention center), “Ant-Man” survived its panel. That alone was a win for Marvel. “Guardians of the Galaxy 2” was announced with James Gunn again at the helm. The main Marvel talker was footage from “Avengers 2” and it received a great reaction. The opening scene showed comedic character work as the Avengers members tried without success to lift Thor’s hammer (Captain America apparently did start to raise it a bit though). Action and Ultron then took center stage, bringing down the house. Legendary Pictures: A year after their much-discussed breakup from Warner Bros., Legendary kept on rolling with a well-received panel that was giant-monster heavy. “Godzilla 2” was announced with the first film’s director Gareth Edwards returning in an “All Monsters Attack”-style battle royale. Fans were left somewhat confused but intrigued by a teaser preview at the end of the panel involving King Kong entitled “Skull Island.” Later speculation pointed toward perhaps a long-term plan to pit Kong vs. Godzilla. Michael Mann made his first Comic-Con visit to publicize the hacker thriller “Black Hat” and Guillermo del Toro’s appearance to promote his upcoming period supernatural thriller “Crimson Peak” was also a hit with the crowd. Kevin Smith: After years ago claiming to have retired from filmmaking in favor of podcasts (and, seemingly, smoking pot all day), Kevin Smith had a nice critical rebound with “Red State” a couple of years ago. Fans seemed to also be interested in his latest effort, “Tusk.” The trailer shown during Smith’s traditional Friday evening panel in Hall H was oddly dark, but featured some of Smith’s usual quirky characters in what seemed like a “Misery”-esque scenario. Along with showing the trailer and re-iterating stories from his recent visit to the set of “Star Wars: Episode VII,” Smith announced that “Tusk” would be the first of three films set in Canada. So much for retirement. Digital Comics: Digital comic book distribution leader Comixology introduced a DRM-free model, offering PDF and CBZ file downloads of comic books. The lack of ownership of the actual files has been a sticking point in the past with encouraging comic book fans to move to the digital medium and this is a move toward addressing those adoption complaints. Many major independent publishers were already signed up for this program at the time of the announcement, but Marvel and DC remained uncommitted. Walter Simonson: Other than Frank Miller having “Sin City: A Dame to Kill For” featured in Hall H, I can’t think of another peer of Miller’s from the 1980s comic book scene who has continued to pull in press attention for his current comic book work. Simonson was featured on several panels this year and had an oddly high presence for someone in his position. Much of the revival with Simonson’s work began as a result of the “Thor” films reigniting appreciation for his legendary run on that character. Simonson’s mark on “Thor” was not unlike Miller’s defining run on “Daredevil” that took place during a similar time period in the early 1980s. His new comic “Ragnarok” for IDW featured the mythological version of the Thor character (conveniently side-stepping Marvel’s ownership of the super-hero character) and was already a reported sellout two days after release. Sony Pictures: Sony had their thunder stolen early in the convention with news that the next Spider-Man film would be “The Sinister Six” and not “The Amazing Spider-Man 3.” Marvel immediately stepped in to claim the release date vacated by the delayed “The Amazing Spider-Man 3.” Sony did have a panel over in the slightly-smaller-than-Hall-H Indigo Ballroom featuring Jack Black in the “Goosebumps” film and an odd Peter Dinklage-starring teaser for “Pixels.” Black gave some amusing interviews after the fact to media members, but not much buzz for either film was generated. Dreamworks Animation: The Dreamworks panel began what initially appeared to be a generally weak Thursday lineup, leading to Hall H being under-filled for much of the day. An uninspiring lineup of upcoming films from Dreamworks didn’t help and even the presence of Benedict Cumberbatch didn’t seem to ignite the crowd. Further hurting matters, Dreamworks reportedly tried to keep all questions focused sharply on their products and away from Cumberbatch’s other rumored projects. The Giver: Another reason why Hall H was easy to enter throughout the day on Thursday was the early afternoon panel for this film generating little interest. A Jeff Bridges-starring sci-fi novel adaptation was probably appropriate for the convention, but it didn’t click with fans enough to fill the biggest hall. Fans of Iconic Filmmakers: The annual Entertainment Weekly Visionaries panel has usually featured a big name director or two. This year they had the controversial Alex Kurtzman and Roberto Orci. Even more ironic, Christopher Nolan had just made his first Comic-Con appearance an hour prior to the Visionaries panel. One had to wonder why panel programmers couldn’t have gotten Nolan to stick around for another hour. DC Universe Fans: Despite the hyped reaction to the “Batman v Superman: Dawn of Justice” peek, the footage shown was extremely short and little more than a planned teaser. Ben Affleck and others associated with the film made what was only a very brief token appearance on stage, basically long enough to wave at fans. Despite a long slate of upcoming DC Universe films being leaked weeks ago by Nikke Finke, virtually nothing new was confirmed. Not even a “Shazam” film was announced despite being strongly hinted by Dwayne Johnson during this “Hercules” promotion in the days leading up to the convention. Doctor Strange: Rumors had the lead role going to everyone from Benedict Cumberbatch to Joaquin Phoenix. Were deals simply not completed in time to make the announcement? With the film not due out until summer 2016, Marvel still has next year to devote Ant-Man-like attention to “Doctor Strange” in next year’s Marvel panel. However, Marvel missed out on adding a proverbial cherry on top of this year’s panel by not announcing the lead role casting. Fox: With fans increasingly skeptical of the upcoming “Fantastic Four” film, Fox needed some sort of presence to make a positive statement. They failed to deliver. A green screen image of the head of the Thing that was leaked online that seemed to be legitimately unintentional (if oddly coincidental) and nothing else regarding the film. Fox had a panel on Friday in Hall H but it didn’t generate much mainstream media buzz for “The Maze Runner” or the “Kingsman: The Secret Service” adaption of Mark Millar’s comic book series. Universal: Despite having a large slate of films in the coming year, such as “Jurassic World,” Universal was largely a no-show at the convention. They had some presence via new partner Legendary Pictures, but Universal proper was oddly silent. Lion’s Gate: Talk about a shocker. In the past, Lion’s Gate had a large presence at the convention but this year they were without a panel. Even with “The Expendables 3” debuting in a couple of weeks and a new “Hunger Games” film looming, Lion’s Gate chose not to present. Disney: Films like “Tomorrowland” and upcoming Pixar releases received no publicity, since Disney proper didn’t have a panel. In the past, Disney has opted to keep certain presentations for their D23 convention in Anaheim. Unfortunately, the next D23 convention won’t be until August 2015 and many major films from Disney open prior to that date. One thing that might have Comic-Con fans worried is that Disney may use “Star Wars: Episode VII” to snub San Diego next summer in favor of D23. The Hobbit: There was polite excitement for the conclusion of a trilogy that hasn’t fully connected with fans in the same way that the “Lord of the Rings” films accomplished. After years of anticipation, the magic of that first trilogy wasn’t yet fully recaptured in the new films. It seemed unlikely that this final film would be able to be the savior of this second trilogy. The panel content itself was received well enough, but the original expectation for these films was that the final “Hobbit” should have dominated media attention. Lesser Panels in General – It was not surprising that the big media sites don’t touch on many of the non-Hollywood panels. Unfortunately, the comic book-specific press under-reported more than ever this past year. It was harder than in the past to find information on annual spotlight favorites like Terry Moore or Jeff Smith, to say nothing of the panels featuring even lesser creators. Stan Lee: It was ironic that laryngitis would reportedly lead to Stan’s attendance cancellation. Hopefully his illness was only limited to that issue, as the convention has very few comic book legends of his stature left available. Zombie Attack: The mainstream media reported on a strange incident that occurred on Saturday afternoon during the annual ‘Zombie Walk.’ The original story alluded to a carload of deaf people being somehow terrified by suddenly coming upon a zombie horde that ‘surrounded’ their car. The zombies then apparently attacked the vehicle, with claims of a zombie jumping on the vehicle’s hood and smashing the car’s windshield. The ‘attack’ caused the driver to speed away, resulting in an arm injury to an elderly woman who happened to be in the area at the time. This all sounded pretty wild and wonderfully sensational. When a video was later released, it appeared more likely that the incident involved people who saw a never-ending horde of people and figured they would be stuck in their vehicle until the end of time if they didn’t ‘nudge’ their car into the crowd. The entire confrontation only lasted a few seconds but it was surprising that more injuries didn’t occur. Mike Tyson Mysteries: Another chapter in the strange post-boxing career of Mike Tyson. The show’s premise sounded like an odd take on Scooby-Do, with Tyson playing both Scooby and Shaggy in a single role. Tyson was, as always controversial and with good reason. Many still wonder why Tyson has been accepted in pop culture while Mel Gibson has been banished – a point that came to a head on the “Hangover” films with Gibson’s planned cameo getting axed while Tyson appeared in multiple films of that series. Who would have ever thought that Tyson would be featured in a lesser convention panel, playing b-story with other sports-entertainment icons like Hulk Hogan (who appeared on a wrestling-related panel) amid similar low levels of publicity coverage. Quentin Tarantino: Oddly under-reported, Tarantino’s Sunday panel was a victim of poor timing. It took place in a smaller venue than one might have expected, with Tarantino primarily discussing comic book-related projects such as a “Django Unchained” sequel comic. He also confirmed that “Hateful Eight” was officially moving ahead toward filming and (again) teased a unified, longer version of “Kill Bill.” He apparently received a massively-enthusiastic reception by the fans in attendance, but the Sunday afternoon timing was not great for publicity. People were likely packing up or travelling, leaving the media slow to report Sunday stories. Creeping: While not a new issue, the continued increase in the number of female attendees has brought even more media attention on the problem of sexual harassment at the convention. While not exclusively a problem amongst women in cosplay outfits, they were likely the most frequently targeted. There has been an uncomfortable debate occurring on this topic where some arguing that fans wear suggestive costumes as a way to gain attention, but then get upset when they’re harassed. This was clearly a complicated topic likely to continue to make news in the future. Star Wars Comics: News of Marvel releasing a Marvel Omnibus collection containing the first half of their classic non-canon original “Star Wars” series leaked out before the convention. Announced at the convention was the first wave of in-canon titles that Marvel would be producing now that they have the publishing license formally held by Dark Horse Comics for nearly twenty-five years. The preview pages looked impressive and the stories would be taking place after Episode 4. Exclusives: Like most trends at the convention, this trend has been building for several years but now runs the risk of overshadowing the entire convention. People have spent increasing dollars on convention ‘exclusive’ comic books, toys, and other related items. Unfortunately, the motivation of many was to tell re-sell those items on eBay for an immediate profit. Some had even listed ‘pre-sale’ auctions in advance, promising to ship the items after picking them up in San Diego. What this led to were more convention tickets than ever simply being sold to people interested in flipping exclusives. Flippers purchased tickets and then stood in multi-hour lines every day that then clogged up the exhibit hall walkways. A story circulated near the end of Comic-Con that Chuck Rozanski would pull his massive Mile High Comics booth next year from the convention after 42 years of attending due to exclusives cutting into his business. This wasn’t the first time that Rozanski has voiced anger toward the convention regarding what he has seen as various problems and his threats of departing often sound like the proverbial boy who cried wolf. Trends continue to push comic books to the sidelines, but Rozanski’s logic on the exclusives problem from his perspective didn’t entirely hold water. Basically, he was demanding that publishers allow him to be the middleman on exclusive items and skim his resale fee off of those sales. Yes, that might be how things work in the normal comic book store distribution model, but until retailers exert leverage against publishers and toy makers who sell exclusive items at conventions, this trend isn’t going to change. Line Con: Again, this was the continued escalating of a multi-year trend that tied back to the exclusives problem but also affected access to the higher-profile panels. The convention attempted a new tactic this year of handing out wrist bands that would give an indication to those in lines as to the capacity of the room. Predictably, this policy simply encouraged people to try to get into lines sooner than in the past to assure themselves the peace of mind of a wristband. The most talked-about line of the convention was the one for Hall H’s Saturday panels. A ‘guerrilla’/unofficial line began against convention policy at 2:00pm on Friday afternoon. Due to security not breaking up that line in a timely manner, it eventually became the official line. Those who were not in line by sometime before 2:00am on Saturday morning would not have made it into the Marvel panel on Saturday evening (to say nothing of the morning Warner Bros. Panel). Basically, many stood in line for over twelve hours and were turned away. With people also potentially having issues booking hotel rooms or simply not wanting to spend the money on an expensive room, the motivation to ‘camp out’ has become ever greater for attendees. Turning panel attendance into ever-escalating endurance contests isn’t a sustainable plan for the convention organizers and only further exposes them to some manner of high profile incidents. Two years ago, a woman died while running across speeding traffic after becoming frantic about potentially losing her place in a line move, but even that incident was largely now forgotten as an anomaly. If there was an obvious answer to the continued escalation in fanatic behavior, the convention organizers would have already tried it. Hopefully organizers eventually come up with new ideas that aren’t entirely reliant on simply moving to larger venues. Comics Marginalization: More than ever, actual comic book purchases continued to be an afterthought in attendee spending at Comic-Con. To be sure, sales were still occurring – Chuck Rozanski’s Mile High Comics reported having sales of $1000/hour. However, most attendees aren’t buying back issues of expensive comic books at the San Diego Comic Con like they might at a more-traditional comic book convention. As has been the case for years, we’re headed toward a future where only exclusives, some comic book trade paperback/hardcover collection books, or small press comic books are sold at the convention. Television Shows Ever Popular: Ballroom 20 used to be the exclusive home of big television panels, but over the past couple of years those panels have encroached on the traditional film-heavy turf of Hall H. This past year, television again dominated Friday in Hall H and shoved the biggest film panels into Saturday. Cosplay popularity also showed major spikes trending toward television and away from comics or films. 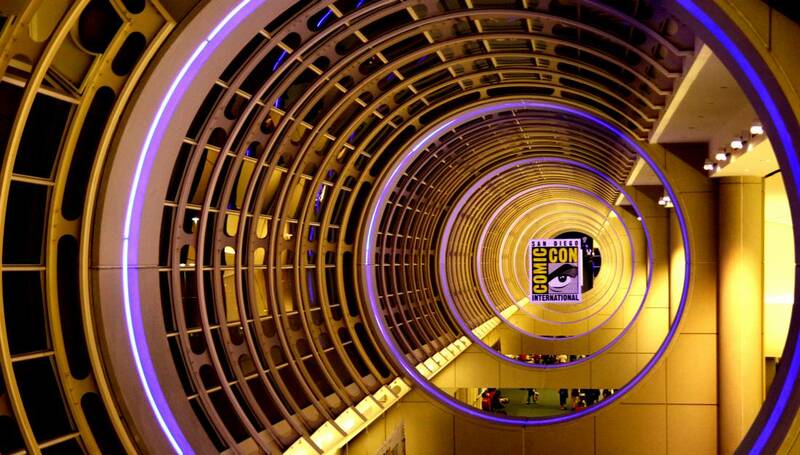 Many see the rise of television as ushering in a new chapter in the SDCC history, as it leaves behind a decade of film dominance and television continues to rise into the top spot. Unfortunately, many of these television panels didn’t deliver the shocking reveals associated with the film panels. For example, the “Game of Thrones” panel provided a few casting notes, but little of significant substance was shared with fans. Many of the television panels seem to exist as fan parties to celebrate the prior season – while studios push the DVD/Blu-Ray set – rather than being showcases for the coming year. The ‘New’ Zombies: Paranormal/creature trends have obviously been big news for many years. Unlikely as it might have seemed a few years ago, zombies appear to have long since overtaken vampires in popularity. What was waiting in the wings to overtake zombies? “The Walking Dead” creator Robert Kirkman was quoted as suggesting that “Demons are the new Zombies.” It was hard to say how accurate that prediction might be though, since demons have never experienced the same historical cycles of popularity as vampires or zombies. This cycle of paranormal popularity contests will be an interesting trend to continue to monitor.